A complex of Maca with Spirulina that constitutes a whole, natural and pure nutritional source. 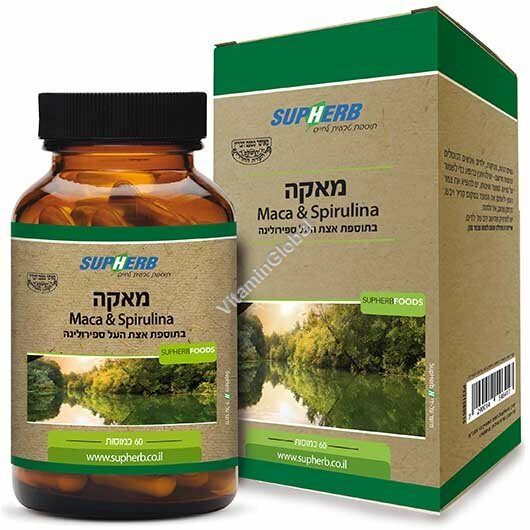 Spirulina algae is highly important nutritionally since it contains a high concentration of nutrients essential for the proper functioning of the body. Spirulina is a microscopic alga, which thrives in hot climates and fresh water. It supports a wide variety of diseases and deficiencies in the body such as malnutrition, immune weakness, digestive problems, the profusion of toxins in the liver, allergies, various infections, and more. Directions: 1 capsule a day, with the meal. Kosher under Rabbinical supervision of Badatz Haeda Hacharedit.